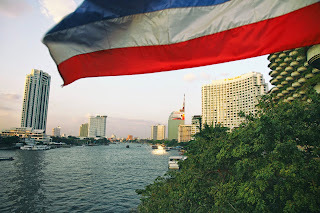 Chao Phraya River, Bangkok, Thailand. Like all urban rivers, the history of the Chao Phraya is intertwined with the city it flows through. The original site was chosen by early settlers because of its fertility and abundant fish. Later King Taksin, after the fall of Ayutthaya to the Burmese, located his new capital here, on the western banks today known as Thonburi.